QMS is announcing that it has expanded its leadership team and overall business development capabilities by naming Rich Labbadia, Vice President of Professional Services. 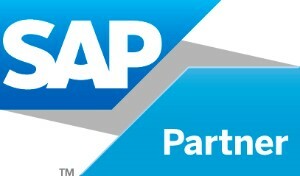 QMS is an SAP Partner and leader in SAP Consulting with a focus on Manufacturing Industries. 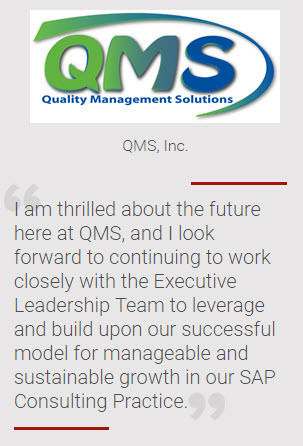 Quality Management Solutions, Inc. (QMS), an industry leading provider of professional services and solutions for SAP specializing in Quality Management and Extended Supply Chain in manufacturing industries, announced today that it has expanded its leadership team and overall business development capabilities by naming Rich Labbadia, Vice President of Professional Services. Rich joined the QMS leadership team as Practice Director in April of 2015 and has since been instrumental in leading the company’s initiatives around staff development, strategic service offerings with key clients, and the closing of new business opportunities. Rich brings over thirty years of successful leadership and entrepreneurial experience in Technology and Operations to the QMS team. In previous positions, Rich has proven to be a dynamic Executive-level resource and has used his communication and presentation skills to great success. He conducts business with high ethical standards and has a highly successful proven track record of operational and professional services leadership excellence. Throughout his career, Rich has held leadership and executive level positions leading to three acquisitions and an IPO. He has had Operational and Professional Service Line Leadership responsibilities, managing $50m+ in revenues, 165+ employees in five offices with his primary focus on promoting revenue growth, high profitability, high utilization, and staff development. 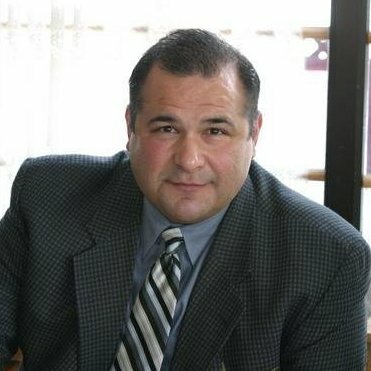 As founder and CEO of Confide IT, Inc., a professional services company, Rich led the company through seven years of strong growth, and negotiated a successful acquisition in 2008. He also held positions as Vice President/COO of Northeast Operations & Global SAP Services at Commerce One and AppNet (which IPO’d in 1998), as well as Vice President of Operations & Professional Services at Research & Planning (R&P) prior to its acquisition by AppNet in 1997. Early in his career Rich held various positions at companies like GTE, PepsiCo and IBM. Rich’s main focus will be to assist in developing, refining, and executing QMS’ overall vision and strategy around its Operations, Professional Service Lines and target market(s) for its SAP and industry specific service offerings. Rich will be responsible for observing, refining, and executing the overall sales and business development process to carry out the company’s go-to-market strategies efficiently through the use of key partnerships, direct sales, leveraged networking, and niche markets. Rich will also lead QMS’ Training and Special Services, while enhancing the current staff development program across the organization. The addition of Rich Labbadia to the QMS leadership team is a strategic step in the continued growth and overall success of the organization. 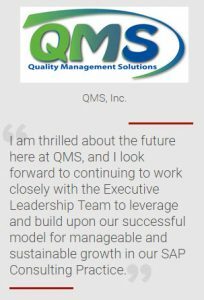 About: Quality Management Solutions, Inc. – QMS is an SAP Partner and has earned a global reputation for quality leadership, resources, and delivery of SAP projects. QMS is the preeminent quality management expert in SAP, with decades of combined industry and business experience. QMS is dedicated to developing advanced solutions for SAP manufacturing environments and bringing those results to our customers in affordable and innovative ways. Our number one priority is to partner with our customers to make meaningful impacts on their businesses, enabling our customers to achieve their business objectives. Since its inception, QMS has experienced rapid growth, quickly earning recognition as one of the most innovative, trusted and successful SAP consulting solution providers in the U.S. and around the world. QMS has worked extensively with companies in regulated industries including: Manufacturing, Medical Devices, Scientific Instruments, Pharmaceuticals and Bio-pharma. QMS also works with Food, CPG, and Chemical companies as well as Automotive, A&D, and Equipment manufacturers. We have used this vast industry experience to develop our “Solution Set” offering of “Best Practices” for the implementation of SAP. **SAP, SAPPHIRE, and all SAP logos are trademarks or registered trademarks of SAP SE in Germany and in several other countries. All other product and service names mentioned are the trademarks of their respective companies. This entry was posted in News and Events, Press Release. Bookmark the permalink.